Welcome to my webpages. The QR-tag you scanned has led you to this page which is in English. The rest of my site is still in Dutch, but to be able to see my other works just click on "Foto galerij" in the bar at the top of the page. A sub-menu will appear. The top one is a link to my most recent works, the 2nd shows some pictures of me while I am glassblowing, the 3rd shows some blown work, the 4th shows fused plates, the 5th are glassworks which can be hung (either on a wall, or in front of a window), the 6th shows casted glassworks and the final shows some "non-glass" works. Some background information on the why and how of "Imperfect"
Last year I showed "Burn-out" (see this link). Compared to the situation a year ago my situation is slowly improving, but I still cannot work as long and concentrated as before. I am still easily tired and currently work only half days with a severely smaller workload. 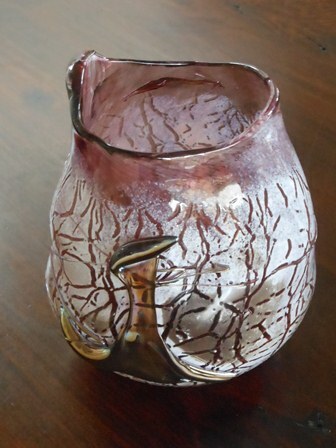 Also in my glassblowing I was not able to work on large pieces. Most of the works were paperweights and small cups. Glassblowing larger pieces was both physically (the weight and heat and time it takes to make a larger piece do not scale linear it seems :-) ) and mentally (losing your concentration for a split second means that you are no longer in control and the glass will be "all over the place") to demanding. Currently an important part of my re-integration effort is the weekly discussion with a psychotherapist. We discuss a lot about my unrealistic demands for myself. These unrealistic demands have played a very important role in getting into the burn-out in the 1st place, also they are still preventing a good and fast re-integration. Mentally I can see that I have been imposing unrealizable targets upon myself, but acknowledging that is a whole different story. Glassblowing helps me in this process, because also there this behavior was/is present. When a work was not nearly perfect I was not willing to "accept" that and would rather smash it in pieces (which in itself is quite nice to do) than accept it as it was and show it to other people. This piece was blown in January 2014 and it was the 1st time I tried to make a "larger" piece after a whole year of just making small glassworks. As you can imagine it did not go very well, but to force myself in accepting my "imperfectness" I did not toss the work into the wasted glass bucket halfway, but I kept working on it, trying to make the most of it, while still enjoying the process itself. What came out is far from perfect, you can see that there is a crack in the glass halfway around the piece, also the shining glass which was put on to try and hide the crack failed more or less, but I still have put it in the annealing oven (annealing means bringing the temperature of the glass down slowly, so there will not be too much stress in the glass). All in all it is very strange for me to show a glasswork of which I am not "proud", but given the re-integration phase I am in, I still think it is good for me to show it to you. Last year I received a lot of heads-up mails and call's on my Burn-out sculpture, please feel free to contact me if you feel the need to talk to me about your process. ASML is for the most part a very "no I have no problems whatsoever"-company, but there is also room and understanding and even a lot of support !! if things are not really going your way.